Hyundai Motor Company is the official partner for the ICC tournaments. 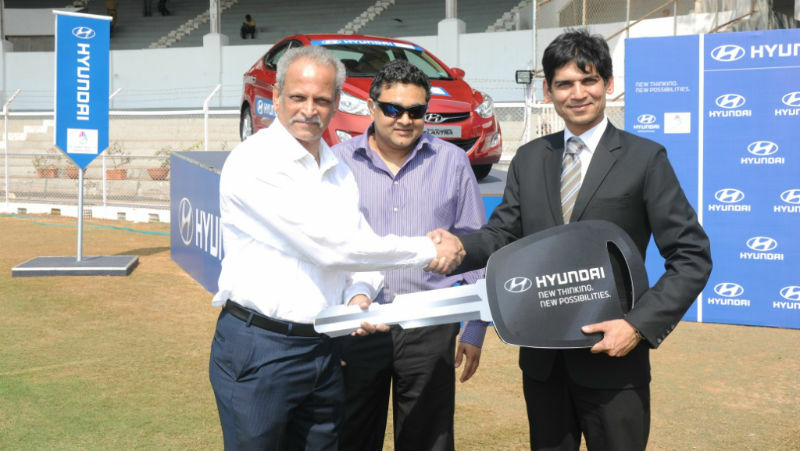 Its subsidiary Hyundai Motor India Ltd handed over the key of the Hyundai fleet of cars for the ICC Women’s World Cup 2013 in Mumbai on Thursday. A total of 12 Hyundai cars were presented by HMIL officials to the Cricket Club of India at the handing over ceremony at the J. N Tata Pavilion, Brabourne Stadium in Mumbai. The whole fleet that comprises of vehicles like new Sonata, Elantra and Verna will be used by the ICC officials and the participants. General Manager and Group Head of HMIL, Mr. Nalin Kapoor said on the occasion that the company is proud to be associated with the ICC as official partner and is delighted to handover the cars. He further said that with the work engaged in building the momentum for the tournament it is quite sure that the tournament will be a huge success and company also wishes good luck to the participants. Hyundai is the official partner for the ICC from 2011 to 2015. HMIL will also be promoting the Women World Cup India 2013 on social media and platforms like twitter and Facebook. Through the social media HMIL will also be sharing exclusive images, match schedules and highlights in addition to the quiz that will be engaging Indian cricket fans. Hyundai dealers have also been planning several other activities to promote ICC Women World Cup 2013.